Whether you are an experienced horseback rider or a “want-a-be”, you will love Aruba horseback riding on the beach and along the countryside. 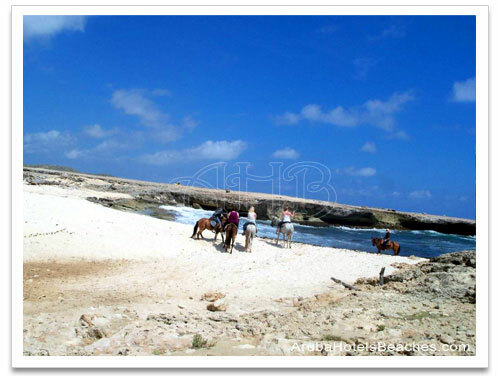 There are various Aruba Horseback Riding Tours to chose from that will allow you to explore Aruba’s coastline and its northern rocky shores. The guided horseback riding tours are even offered in the early evening so that you will be able to experience the most breathtaking Aruba sunsets on horseback. The experienced, friendly guides will match beginners and experienced riders to a horse for a much more enjoyable ride. The horses appear to be smaller than what you would expect to see. Most are Paso Fino horses, they are very responsive and even tempered. Most tours will bring you to various Aruba attractions, such as the Natural Pool, the Gold Mine Ruins, the Ostrich Farm, the Alto Vista Chapel, and allow you time to stop and take photos. 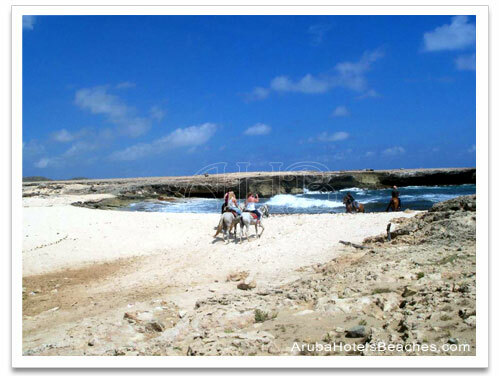 Some Aruba Horseback Riding tours take you on an excursion through Arikok National Park to view the natural desert terrain like cactus, lizards, owls and more. 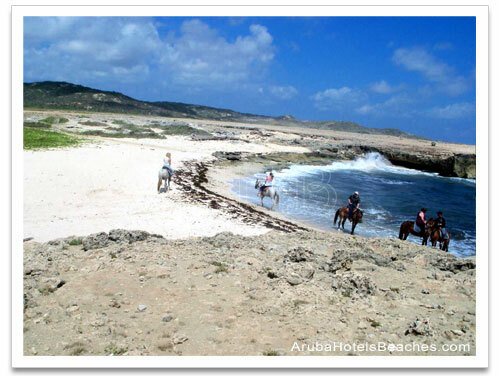 Afterwards you will ride along the sand dunes and the spectacular beaches of Aruba. Make sure you wear long pants, proper shoes, such as sneakers, and most important, don’t forget your sunblocker! The tour guides will provide water or soft drinks. Some tours also include lunch and most include transportation to and from your hotel. After an adventurous day of Aruba horseback riding why not spend the afternoon at Baby Beach and enjoy a fun snorkeling experience.